Twenty-two folk met at Cheam Lake Wetlands Regional Park (CLRP) to spend a glorious Wednesday morning walk, and we saw a few birds too. Check out the photo evidence on our DNCB Flickr site. Eight of us left Petra’s at 7:45 a.m. (someone was late) and car-pooled in three vehicles on the 1 ½ hour drive to Cheam Lake. New Highway 17 and then Highway 1 were not terribly busy and my ride with the local legends, Roger & Mike, was fascinating as they recounted a few of their 1950’s adventures in the Fraser River delta. We got to the CLRP parking lot at 9:25 a.m. where the other 16 were waiting (Janice since 8:15 a.m.). They had already seen a couple of Green Herons and were watching the Ospreys feeding at least one chick on a distant nest across the lake, I think on BC Nature Trust property. Following introductions, especially of the Newbies, including the three members of the local Chilliwack Field Naturalists (CFN) club, the three young ladies with the Nature Trust of BC, White Rock Al’s friend Maggie H, and Carolyn & Chief Bill, the Queen’s New York visitors, Roger and Nature Trust Maria took our Group Photo. Then we conscripted Janne P, local CFN expert, to lead us on our outing (thanks, Janne). It was overcast, but not raining as we wandered toward the floating bridge and lookout. Lots of beautiful flowers in and around the “study” pond, including Wapato Arrowhead (apparently not often seen in bloom), yellow Water Lilies, Daisies, Tansey, Yarrow, etc. For the longest while, we neophytes focused on a bird posing on a branch near the floating bridge until finally Sammy, our Nature Trust expert, identified it as a Red-eyed Vireo. Of course, Roger said he knew it all the time. Lots of Cedar Waxwings around, some feeding young. Janne saw Swainson’s Thrushes (perhaps a Hermit too) from the Lookout. Others saw Ring-necked Ducks in the lake. Broadening our horizons, some focussed on small Fry in the water, possibly Cutthroat Trout. I think Richmond Brian and I were the only ones to see a Western Tanager. We were blanked on the Bullock’s Oriole. Continuing back, most of us followed Janne along a new (to us) Creek Trail. We had some neat sightings along this one kilometre circle/loop trail, including Red-breasted Sapsuckers and Downy Woodpeckers, Willow Flycatchers, both Black-capped and Chestnut-backed Chickadees, and Pine Siskins. Some missed seeing the Red-breasted Sapsuckers, adult and juvenile, as they were busy focussing on a Crayfish in the creek. Several Western Wood-Pewees were calling, but we couldn’t find them. Others were thrilled with the Pacific Sideband Snails on the path, which are native to BC, but “Blue Listed” Species at Risk. A number of participants learned a lot from Janne and Nature Trust Sammy as they pointed out and described much of the flora and fauna along the trail (Note: one is a number). We got back to the parking lot where other directionally-challenged DNCBers were waiting. We then took the Loop Trail where several (i.e. more than two, possibly a family) Belted Kingfishers were noisily flitting above the pond, perhaps catching Dragonflies (my guess). They had earlier been aroused by a Cooper’s Hawk. A tiny Rabbit at our feet on the path, was unfazed by us and the camera clicks as it wolfed down a Dandelion. 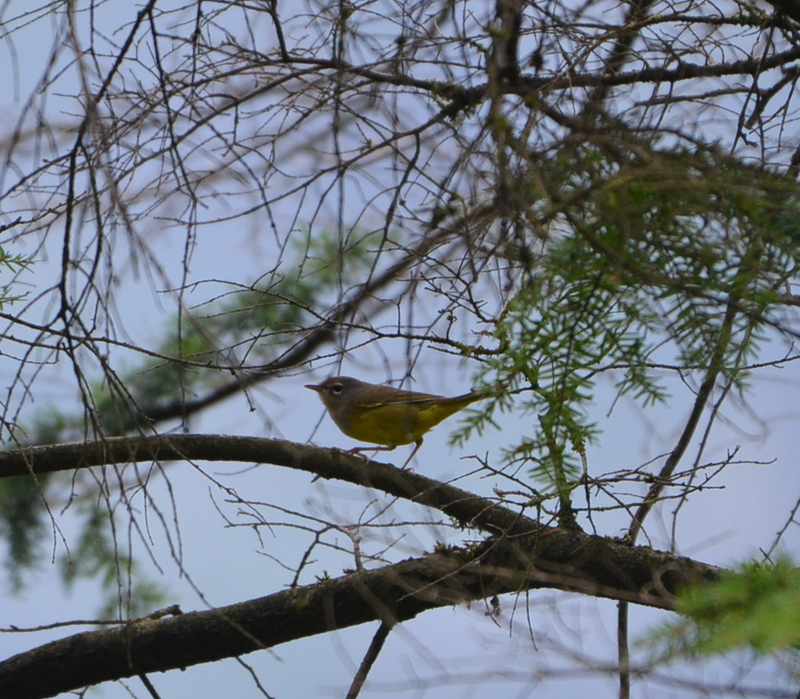 We saw more Willow Flycatchers and Chris photographed a MacGillivray’s Warbler. It had warmed up nicely, and the fog had lifted, giving us a beautiful view of the Bridal Falls as a Turkey Vulture cruised by. Approaching 12:30 p.m., since I had another Drs. appointment (hopefully the last), some of us ended the outing and drove back to Tsawwassen. Others continued birding for a while and then split up, a few dining on home-made pie at the Chilliwack Airport, and a group of eight at a local Chilliwack restaurant. Sorry, no details on their menu. I had Swiss Chalet chicken in Surrey after my Dr. appointment and watching our granddaughter at her first swimming lesson at Sungod Pool (riveting stuff, eh). Another awesome DNCB outing, with some new faces and the occasional tidbit of interesting conversation. The twenty-two were: Roger & Mike, half-Ontarian Janice, Margaretha, Photogs Terry, Chris McV, Richmond Brian, sisters Maureen & Pat with Manli (or Jennifer, not sure of her name), New Yorkers Chief Bill & Carolyn, BC Nature Trust Newbies Maria, Candy and my new BFF Sammy who carried our Scope, White Rock Al with Alice & Newbie Maggie, and our three local CFN experts Janne, Bona and “I forget” (help pls Janne), and me. Next Wednesday, August 10, we will do our annual Salt Spring Island Ferry Outing, taking the 10:20 a.m. ferry from Tsawwassen Ferry Terminal, arriving at Long Harbour at 1:35 p.m., and returning to Tsawwassen on the 5:00 p.m. ferry from Swartz Bay. This entry was posted in *DNCB, Cedar Waxwing, Cheam Lake Regional Park, Cooper's Hawk, Crayfish, Green Heron, MacGillivray's Warbler, Osprey, Pacific Sideband Snail, Red-breasted Sapsucker, Red-eyed Vireo, Turkey Vulture, Western Tanager, Western Wood-Pewee, Willow Flycatcher. Bookmark the permalink.